is a freelance writer based in Bend, Oregon. His first taste of journalism was as a high school intern shadowing a reporter on the tropical island of Grenada. Since then, he’s been jotting stuff down. His writing has covered topics of travel, the outdoors, real estate, home improvement, business, history, and sports. After migrating west from his Massachusetts origins and earning an English degree at the University of Colorado-Boulder (taking a brief hiatus to hitchhike around New Zealand and work at a horse-whisperer ranch in Australia), he settled in the heart of Oregon. Work experience in publishing and copywriting helped round out his writing career. In the pursuit of a story, he has jogged across Maui with a baton, climbed into a “getaway” car during law enforcement training (which resembled something of a high-speed demolition derby), suited up for a hospital's operating room practicum, and profiled a range of individuals, from quantum physicists to furniture builders. 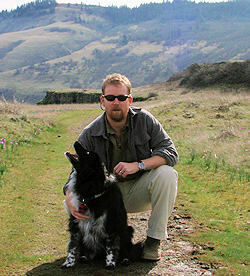 He and his wife enjoy old homes, outdoor adventures, and a life peppered with dog walks.